9.6.06 - You can bid to have dinner with Mike Farrell and Shelley Fabares. All proceeds benefit the ACLU. 9.20.04 - TV Guide Online - Red hot mama: CSI: NY star Melina Kanakaredes set the Emmys red carpet a blaze with her stunning scarlet dress. That was then: She portrayed Sydney Hansen, a Los Angeles plastic surgeon turned Rhode Island family doctor on the popular sentimental drama Providence. This is now: In CSI:NY, CBS' third installment in the smash-hit forensics series, Kanakaredes is Stella Bonasera, a workaholic crime scene investigator driven "to find out the truth" in her cases because her dad was murdered by unknown assailants. Between then and now: "Three weeks after Providence ended, I had a beautiful little girl." (Karina is now 16 months old; older sister Zoe is 4.) She also sang and danced on Broadway in "Cabaret," and made two yet-to-be-released films, "Cruel and Unusual" and "Into the Fire." What I like about my new character: "I'm impressed by her diligence, intelligence and strength. I also like that I get a chance to play someone significantly different from what viewers are used to seeing me play." If the old TV character squared off against the new one, who'd win? "Stella would win. She's just tougher. Sydney would give in; she'd go, 'OK, I don't want to hurt your feelings.' Stella's like, 'F--- that, I'm taking care of business.'" 5.7.04 - Lifetime has picked up the off-net series Providence (NBC Enterprises) which will join its schedule immediately, airing at 8pm, according to Variety, and used as a lead-in to Lifetime's new slate of 9pm movies. 8.11.03 - From TV Guide Online: Providence alum Melina Kanakaredes has signed a deal to exec produce and star in the CBS drama pilot ICE, Variety reports. The actress will play a member of the Bureau of Immigration and Customs Enforcement, a wing of the Dept. of Homeland Security. 1.30.03 - Melina Kanakaredes gave birth to a daughter, Karina Eleni, on Saturday, People reports. This is the second child for Kanakaredes and hubby Peter Constantinides. 1.17.03 - At the Television Critics Assoc. press tour in Hollywood, it was confirmed that Providence will definitely not be coming back to NBC. 11.27.02 - Mr. Sterling, staring Josh Brolin, is scheduled to debut on January 10 at 8pm replacing Providence. Providence, meanwhile, may be getting a pardon. Jeff Zucker promises to take another look at it in January. 11.26.02 - From TV Guide Online: Fate may be smiling on those Hansens yet again. NBC is having second thoughts about cancelling its feel-good Friday drama Providence, which is slated to end Dec. 20. Based on the show's promising Nielsens, Peacock entertainment president Jeff Zucker told the cast last week that he's thinking of ordering another 13 episodes next season. "I told them I would take another look in January," the exec tells the New York Daily News. "I did not cement the door shut." 10.21.02 - NBC has cancelled Providence after five seasons. A two-hour series finale will air on Dec. 20. Naturally, the network describes the show's swan song as "a touching, heartwarming send-off for the entire Hansen family." 9.24.02 - The ACLU is holding a benefit auction on eBay and one of the items for sale is a walk-on role on Providence. 8.19.02 - Mike Farrell has been recruited to play Enron chairman and CEO Kenneth Lay in CBS's upcoming Enron movie "The Crooked E," according to The Hollywood Reporter. Shannon Elizabeth ("American Pie") and Christian Kane (Angel) have also been cast in the film, which is based on Brian Cruver's memoir "Anatomy of Greed." 7.23.02 - Providence will have its season premiere on Friay, October 4th. 5.15.02 - TV Guide Online: Providence Star "Frustrated" by NBC - How does Providence star Mike Farrell, who plays papa to heroine Melina Kanakaredes, feel about returning for a fifth season? "I'm delighted," he tells TV Guide Online, "in spite of the hiccup where NBC said, 'We're not sure if you're coming back' and we had to hold our breath and wait. I was thrilled on Friday, when we got the word...."
3.29.02 - The Providence episode "The Invisible Man" has received a nomination for a PRISM Award. PRISM Awards honor the accurate portrayal of drug and alcohol use and addiction in the entertainment industry. The awards are presented by the Entertainment Industry Council, a nonprofit group that encourages social responsibility in the entertainment world, along with the Robert Wood Johnson Foundation and the National Institute on Drug Abuse. The ceremony will take place Thursday, May 9, and be taped for a syndicated broadcast by Tribune Entertainment. 12.1.01 - From the December 1st issue of TV Guide: It doesn't take a stretch of the imagination for Concetta Tomei to play a dead woman who comes to life in her daughter's dreams on the NBC series Providence. "I've had those dreams," says Tomei, who stars as Lynda Hansen. "I see no difference in this life and the afterlife. I've dreamt about people so strongly that have passed awayuncles and aunts and people that I've lovedand I think, 'Oh, my God! That was a dream. But it was really them.'" 11.4.01 - Melina Kanakaredes announced the winners of Best Guest Actor and Actress in a Drama Series at the Emmys (Michael Emerson and Sally Field). 9.29.01 - A walk-on part on Providence is being auctioned off on eBay. A walk-on part is a non-speaking role, or a background player for one scene of one episode. Included with this amazing item is an autographed script of the Pilot Episode, signed by Paula Cale, Mike Farrell, Melina Kanakaredes, Seth Peterson , and Concetta Tomei and a 8"x10" photo of the cast.The winner must be at least 18 years old, and cannot be a member of the Screen Actors Guild or AFTRA. The walk-on will be scheduled during the 4th season, which tentatitively films from August 2001-April 2002. The walk-on will be in Los Angeles, California. Transportation and accommodations are not included. This is a charity auction benefiting the American Civil Liberties Union of Southern California. The reserve price for this item is $2,000. 9.13.01 - Due to disaster coverage on NBC, the season premiere of Providence has been pushed back to Friday, September 28th. 8.23.01 - Jon Hamm (Burt) will be joining the cast of The Division on Lifetime Television this fall, airing Sunday nights at 9pm.� Hamm will play a streetwise detective who will be partnered with C.D. 5.14.01 - NBC's official Fall Schedule was released today, and Providence will be returning next season in its Friday, 8pm ET time slot. 4.9.01 - "Godzilla," starring Maria Pitillo (Tina), will air on NBC on Sunday, April 22nd. 3.27.01 - Rob Estes has been cast as a surfer dude in NBC's Tikiville. 3.8.01 - Melina Kanakaredes, wearing a very body-conscious green dress (it's really hard to believe that woman had a baby last spring), presented the Actor of the Year in a Drama Award to Martin Sheen ("The West Wing") at last night's TV Guide Awards on Fox. 3.2.01 - "15 Minutes," starring Melina Kanakaredes, is due in theaters on Friday, March 9th. 2.20.01 - From the February 26th issue of People: When she was starting out in Hollywood, Melina Kanakaredes resisted pressure to change her last name and play down her Greek roots. What a difference a hit TV series makes. When the Providence star landed the role of a TV reporter romanced by Robert De Niro in the upcoming thriller 15 Minutes, the director, John Herzfeld, insisted that her character be of Greek heritage too. "I looked over at Bob and thought, Well, playing Italians didn't do too badly for him. I said, 'Okay, but Bob has to speak Greek in the movie,'" says Kanakaredes, 33, who got her wish. "The only thing that I could think of, in a very selfish way, was that all my relatives in Greece were going to see him speaking Greek. And I taught him. How cool is that?" 2.12.01 - NBC had its best A18-49 demo delivery on a Friday night in a year with a 5.3/15. Providence delivered a solid performance with a 4.9/15 among A18-49 followed by Dateline NBC which delivered its best demo rating on a Friday night (5.5/16) since April 23, 1999 when it covered the Columbine shootings. Law & Order: SVU filled out the night winning the 10pm hour with a 5.4/15. 1.22.01 - Last night Melina Kanakaredes, along with Eriq LaSalle ("ER"), presented the Golden Globe award for Best TV Series - Drama to "The West Wing." 12.29.00 - Melina Kanakaredes has been nominated for a TV Guide Award as Actress of the Year in a Drama Series. 9.13.00 - People.com and Ford are sponsoring a contest to win a walk-on role on "Providence." 7.20.00 - "Providence" has been nominated for an Emmy for Outstanding Costumes for a Series ("Syd in Wonderland"). The Emmy Awards will be presented on September 10th and broadcast live on ABC. 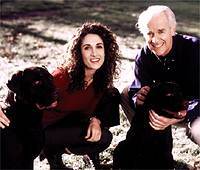 5.29.00 - Melina Kanakaredes gave birth on May 23rd to a daughter. She and her husband, chef Peter Constantinides, have yet to decide on a name. Both mother and daughter are reportedly doing well. 3.6.00 - A noticeably pregnant Melina Kanakaredes graciously accepted her award for Favorite Actress in a Drama at the TV Guide Awards last night. 2.11.00 - "Providence" has received a nomination for a TV Guide Award for Favorite Drama Series and Melina Kanakaredes has received a nomination for Favorite Dramatic Actress. The awards will be broadcast on Fox next month. 1.10.00 - "Providence" won a People's Choice Award for Favorite New Television Dramatic Series. 12.3.99 - "Providence" has received a People's Choice Award nomination for favorite TV drama. The awards will be presented on January 9th, 2000, and the ceremony will be broadcast on CBS. 9.1.99 - TV Guide reports that because of the show's success last season, NBC not only renewed the show, but gave it a new soundstage, an expanded writing team and a new set, a full-size replica of the Hansens' Providence home, complete with backyard and porch. 8.4.99 - Melina Kanakaredes is one of the 16 sexiest stars on TV in this week's issue of TV Guide. She can be found on page 18.